For African American artists, prior to 1980, exhibition venues were few, museum opportunities rare and there wasn’t concrete infrastructure for Black art. “Before that time, the primary infrastructure for African American art lay in the hands of academia,” said Larry “Poncho” Brown, one of Maryland’s most prolific artists. 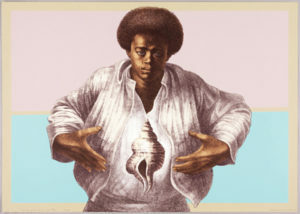 Brown noted that such talented individuals as Charles White, Elizabeth Catlett, Jacob Lawrence, Romare Bearden and others stood above the industry prior to the 1980s while the Harlem Renaissance, AfriCOBRA, and other Black art movements were the last of the noted revolutions in African American art. Today, the recent boom in museums has revealed a devotion to African American artists and the increasing amount of attention paid to these artists has led to a significant rise in forgeries, according to a new report. The ART Newspaper reported that, in the past few weeks alone, there have been many fakes purporting to be the work of Alma Thomas, Beauford Delaney, Charles White, Romare Bearden and Bob Thompson. “It’s a whole generation: you could go from A to Z through the list, from Charles Alston to Charles White. I am seeing fakes attributed to all of them,” New York-based gallerist Rosenfeld told the newspaper. Propelling the fakes market is the fact that many of these artists were overlooked or undervalued in their lifetimes, so scholarship and expertise in their work is limited. “You simply can’t go back to the source any more, and there is only a handful of people who worked first-hand with a lot of these artists while they were alive,” Rosenfield said. For artist Jonathan Green, who owns the popular Jonathan Green Studios in Charleston, S.C., forgeries are of little surprise. “In my 40-year career, I’ve run into more fraud than you can shake a stick at,” Green said. Because African American artists are now appreciated, there’s a high-value placed on their work and that keeps the fraudsters working overtime, Green said. Also, because Black artists have historically been overlooked, so-called art experts are ignorant to many great originals, he said. “A lot of people are capitalizing on this and, in some cases, the fault lies with the museums and the cultural centers because they’re not sophisticated enough to know about these artists,” Green said. Additionally, as noted in The ART, some of the artists whose works are being forged, like Jacob Lawrence, have estates and foundations which should make it easier to authenticate the works. However, foundations just aren’t doing this work anymore because they can’t afford to, said Bridget Moore of New York’s DC Moore gallery, which represents African American artists including David Driskell, and Lawrence. For this reason, Moore says she has always kept detailed “fake files” on all of her artists. Some of the recent forgeries include a 2011 case where Louisiana artist William Toye and his wife, Berry, pleaded guilty to charges of fraud after conspiring with a New Orleans-based dealer over the course of nearly 40 years to sell dozens of works painted by Toye and fraudulently signed as Clementine Hunter, an African American artist who died in 1988. Hunter was self-taught and arguably one of the most significant artists to come out of Louisiana, according to the FBI special agent Randy Deaton, who led the three-year-long investigation. “It was a remarkable case because she was a folk artist,” Deaton told The ART. “She was well known, but there wasn’t an authoritative archive on her career,” which made it easier for Toye to pass off his own paintings as hers. One of the things that gave away the forgeries was the presence of cat hairs on some canvases, the conservator and forgery specialist James Martin, who consulted on the case, told the newspaper. Currently the director of scientific research at Sotheby’s, Martin is the founder of Orion Analytical, which was acquired by the auction house in 2016. “Cat hairs, the same discrepancies in under-drawing and signatures, and dirt wiped on to [the works] to impart a false appearance of age linked the fakes I examined to a common source,” he said. Ultimately though, it was the sheer number of forged works attributed to Hunter by the Toyes that gave Martin a substantial sample size, enabling him to find the forgeries. “Generally speaking, problems with forgeries become easier to spot when seen in large numbers,” he said. Concerns about the authenticity of several works by Charles White were raised when the Art Institute of Chicago was organizing the artist’s first major survey show, according The ART. The exhibition, seen in Chicago last summer, is currently at the Museum of Modern Art in New York and is due to travel to the Los Angeles County Museum of Art next month. According to FBI special agent Timothy Carpenter, who manages the agency’s art crimes division, “it’s not the first time this issue has come up,” but he adds that the fake works that are surfacing are likely to be small or not of very high value, which may make dealers disinclined to formally report them.